Why is this not getting more exposure? This is an officially licensed book showcasing all of DC Comic’s Batman’s toys and the true-to-life equivalents. 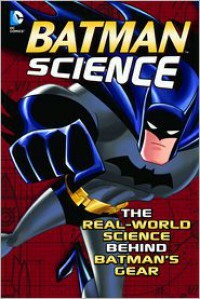 Batman and science—you can’t get much cooler than that! One of the book’s biggest sins is not having a “look inside” function in its Amazon listing. The level of professionalism in producing this book is top-notch. The chapters are broken down into the different Batman gadgetry components, such as flight, weapons, weaponry, and armor. It looks like Capstone has issued these chapters as individual booklets in a series (around 32 pages each). This book seems to combine all of those other books into one volume. Batman fans are going to love this book. The full-page, full-color artwork is found on all 146 pages. Besides the details about Batman’s gadgets and the real-life equivalents, there is Batman trivia throughout. Pow! Each page has a full-color picture of Batman, with text boxes and colored pictures overlaid on top. The boxes do a great job of providing the history of Batman’s toys and then providing the history of their modern-day equivalents. For an example of real-world application, on the section of flight, it talks about how mankind learned flight by modeling birds, then the evolution of flight study, and then of pilots altering the flaps of plane wings to control aerodynamics. The same level of care goes into Batarangs versus throwing stars and boomerangs, the Batwing versus vertical take-off planes, the bullet-proof Batsuit versus bullet-proof vests, and on and on. Batman, science, and a high-production value make this a sure winner. Thanks to Capstone for providing me with a digital review copy; I’m going to be sure to tell all my Batman friend enthusiasts.